My Symptoms: I.am.tired. Shew! I can’t stand being so unproductive, but I literally have to take a nap when the boys nap and when they go to bed, I’m done. It’s taking everything I’ve got to make all our meals, keep the house clean, & chase after the boys. Holy moodiness. Jonathan said this is the worst pregnancy hormones I’ve had yet and I agree. I do think it’s because I am so tired, but I know that’s not really an excuse. Other than that though, I really do feel good and I am so thankful for that. Weight/Baby Bump: At my appointment on 9/7 I was up 8 lbs. (I hadn’t gained any weight yet at this point in my pregnancy with Kade.) My “bump” seriously looks like I’m 7 months pregnant! I’ve even had a few people ask if I was getting close & how much longer. Ha! My midwife said I should start ‘evening out’ around 28 weeks or so. For now, I’m just telling everybody I have exceptional muscle memory. That torpedo with Kade was no joke! Gender: Sweet baby boy! My friend did just tell me that her cousin’s ultrasound was different from what her bloodwork revealed- craziness!! I’m still confident it’s another little man though. We will see for sure at our next appointment. Jase keeps telling everybody he’s got two brothers! 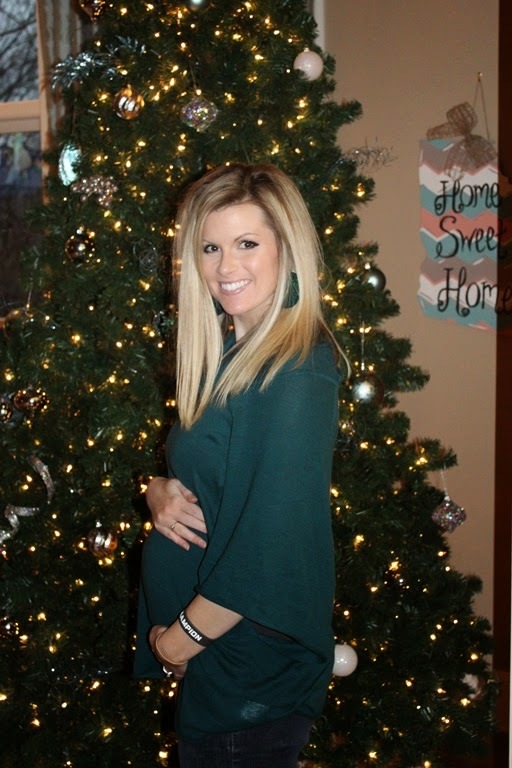 Maternity Clothes: Still wearing regular clothes, but I did rock my first maternity dress. Sleep: Ehhh. It’s okay. My dreams are cuhhh-raaaazy. Movement: Yep, sweet little flutters! One of the best parts. Appointments: I had an appointment on 9/7 and BP was 107/67. Heartbeat sounded good and strong and she said she guessed the baby was weighing around 9 oz or so. Our OB office & the hospitals are going through some changes (merging with another office and certain doctors delivering at a new hospital in our area) so she walked me through all of that. We have the big ultrasound at our next appointment. I can’t believe I’m already almost halfway! Accomplishments: We were out of town for a week straight & it was such a wonderful week! We traveled to Orange Beach for an awesome incentive trip with our Advo team (the boys did great traveling), then off to Dallas for some incredible life/business/leadership training from AdvoCare corporate. Both events were exactly what we needed and we feel like our cups are full. Best Pregnancy Moment This Week: Seeing so many friends we haven’t seen in a while was definitely a highlight. And Laura had baby Mayson…and she is an absolute DOLL! All natural- go Laura! Work Outs: Jonathan is so annoyed that I can “only” go to the gym at certain times (to take the classes), but I don’t feel comfortable working out on my own right now, so it’s that or nothing. I haven’t been able to work out much anyway because he has was working non-stop getting the house ready to sell (we are already under contract- post coming soon with that whole story!). I did get two good workouts in while we were at the beach though. I feel like I’m in much better shape than you would think from lookin at me. Endurance and strength are both still pretty good. Goals: More water. (Seriously, what is my deal?) Less sweets. Thoughts: We need a name! I’m pretty set on Beau but Jonathan said it’s going to have to grow on him. When I ask Jase what his new brother’s name is he says “D-O-S…Baby Kade.” Ha!